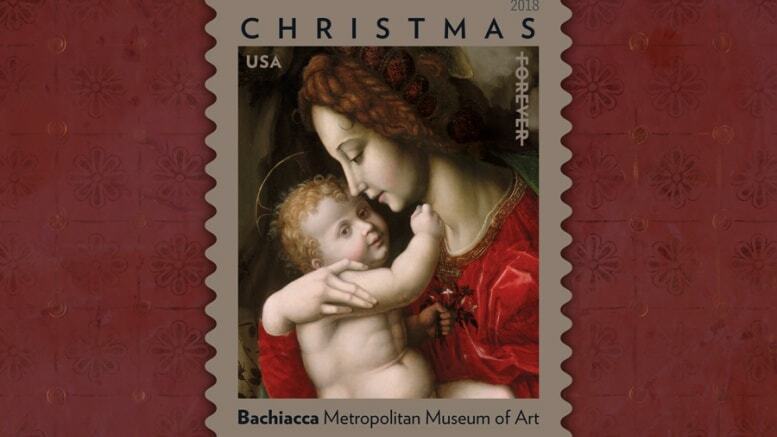 October 2, 2018 — The Postal Service will release a Christmas stamp this week that features a detail of a 16th-century painting by Italian Renaissance artist Francesco d’Ubertino Verdi, also known as Bachiacca. “Madonna and Child,” an oil painting that dates to the early 1520s, depicts the Virgin Mary embracing a haloed Christ child. Bachiacca (1494-1557) relied heavily on symbolism and realism in his work. His painting shows the Virgin Mary clad in red and green — colors used to symbolize love and joy. She cradles the child, who clutches a bouquet of jasmine, a symbol of divine love. “Madonna and Child” is part of the Jack and Belle Linsky collection at the Metropolitan Museum of Art in New York City. Bachiacca is known to have created at least two other versions of the painting, including one in a collection at the Baltimore Museum of Art. The Madonna and Child by Bachiacca stamp will be available in booklets of 20 at Post Offices and usps.com, beginning Wednesday, Oct. 3. Other seasonal offerings include Global Poinsettia, Hanukkah, Kwanzaa and Sparkling Holidays.